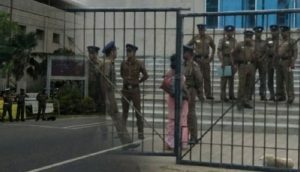 Jaffna News: The Terrorist Investigation Division has demanded permission from the Jaffna court to obtain confessions on Swamy's plea for the LTTE's demand for a separate Eelam. However, the rejection of the appeal was rejected in Sinhala and the court ruled on November 16. Last June, the Amman Kodiyam Amman Temple celebrated the festival of Amman in the same manner as the Tamil Eelam flanked by the Northern and Eastern provinces. Investigations were conducted by the terrorist group. In this connection, the Terrorist Investigation Division filed a case in the Jaffna court. The trial was held today (Monday). During this time, Swami was decorated in the Annamkottai Kannai Amman temple in a similar manner to the Eelam diagram indicating a separate Eelam demand presented by the LTTE. Investigation was initiated. A media journalist, Hindu Youth Council members, members of the temple executive board and temple priest were also received. Confession should be received by the authors of Uthayan, Valampuri and Thinakural who come out of Jaffna in the news release. We have to give the permission for it, "the Terrorist Investigation Division said.